The plant is located on the lower end of campus next to the railroad tracks. After the plant was built, every building on campus had an even temperature. 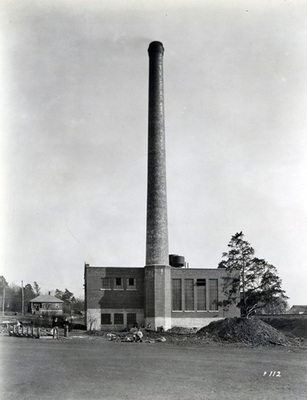 When it was first built, the plant contained two 200 horsepower water tube boilers. In 1930, a 400 horsepower boiler was installed. 1957 - $120,000 new boiler installed. The boiler eliminated fly-ash and soot. The new boiler supplied five more buildings on campus than before. 1963 - $400,000 addition added; the addition increased the heating capacity of the plant by 1/2. In 1963, this reconstruction was the 12th major one on campus since 1956.